In accordance with the FTC, Quill Café would like to disclose that the reviewer borrowed this book from the library. The opinions expressed are hers alone and no monetary compensation was offered to her by the author or publisher. Cover art is copyright Random House Books for Young Readers. I never thought I would like Supergirl. The reason? I have always been exceptionally prejudiced against Superman. Look at me! I'm an invulnerable Ken doll. I have x-ray vison, laser eyes, ice breath, acute hearing, super strength, I'm bullet-proof, and I can fly. Barf. Why would I like a character who's so perfect they're boring? Well, it would appear that the answer lies in narrative. Who knew? So I took my medicine for my Kryptonian allergy and buckled in. Supergirl arrives on Earth with no clue how to control her wild array of new abilities...and it's far from boring. With the aid of her new friends, specifically Barbara Gordon, who helps her to believe in herself and stop apologising for herself (two very important messages for young girls) she learns to embrace her super self. This novel starts off where 'Wonder Woman at Super Hero High' concluded, but you do not need to read the previous novel to understand and enjoy this one. Lisa Yee pulls the reader into the story with the heart-wrenching and intense moment when Supergirl has to flee her planet's destruction. Throughout the novel, Supergirl is sad and homesick. Her loss isn't down-played, but her emotional state isn't stagnant. She does her best to make the most of her new situation, which is far from easy. I couldn't help but identify with her feeling of being an outcast in a crowd. Even when people are friendly, she still feels apart. It isn't until she finds a best friend in Barbara that she begins to find her place and stand tall. My one gripe with Supergirl's characterisation is that she is so clumsy. It seems like an unnecessary trope to include, where Supergirl is literally tripping over her own laces. Controlling that kind of immense power would be difficult enough, without making her a natural-born clutz. However, that trait is rooted in the overall series' characterisation of Supergirl, not in Yee's writing. 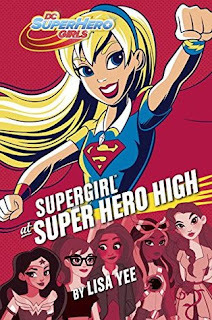 On the matter of the Super Hero Girls cartoon series, if you have seen the feature Super Hero High, this novel follows the same story line and may seem somewhat repetitive. The novel includes extra elements – and thankfully Wonder Woman's jealousy arc has been omitted – and greater insight into Supergirl's thoughts and feelings. If you choose to listen to the book on audio, it is narrated by Anais Fairweather, who voices Supergirl in the show, though the novel is written in third person. The series is continued in 'Batgirl at Super Hero High,' which I look forward to reading.